The most dangerous animals in world are constantly lurking around you. Are they the sharks beneath your feet dangling in the ocean? Or maybe the lions, tigers and bears crawling through the jungle shadows? Or what if it was neither? Hollywood has constructed a truly frightening image of many largely-misunderstood critters. Read on to discover what the actual most deadly animals on our planet on compared to what Hollywood shows us. So what are Hollywood’s deadliest animals? Click to see a bigger version of this poster. While some of these mammals, reptiles, insects, sharks, and arachnids we see on TV and on the big screen may seem frightening, they are really no match for our most dangerous foe. Although none of us want to discover we’re swimming with a shark or find a bear hanging out in our backyard, the real danger is in the tiny little critter buzzing around our room on a warm summer night: the mosquito. That’s right; the biggest and baddest human killer isn’t Jaws or King Kong but that annoying insect that leaves those itchy bumps all over. The mosquito is estimated to be responsible for 725,000 human deaths worldwide every single year. Mosquitos are especially dangerous because of their ability to transmit deadly diseases from human to human, such as malaria, West Nile Virus, Dengue Fever, and Yellow Fever. A study by Choumet et al. 2012 actually shows that, in some cases, infected mosquitos probe under skin for longer periods of time than uninfected ones, which may actually make it easier to spread disease. Mosquitos have a variety of ways to find their prey and are pros when it comes to finding blood vessels. Take a look at the video below and you’ll see that the mosquito Anopheles gambiae can actually orient its mouthparts at almost 90 degree angles while searching for blood vessels. Now if you can imagine the tip of the mosquito mouthpart from the video infected with a disease, it’s easy to see how they can play a part in the spread of infectious diseases. Deaths and spread of disease promoted by mosquitos is an extremely serious issue, especially in countries with less-than-stellar access to health care and protection. Compared to mosquitoes, the rest of the most commonly-portrayed human predators look warm and cuddly by comparison. Perhaps not surprisingly, the second worst enemy of humans is, well, humans. At 425,000 estimated deaths per year, humans dwarf the next-best human hunter. The third most deadly animal is the snake, a creature we DO actually see every now and then in Hollywood films (see: Snakes On a Plane). The snake is a distant third, however, in this unsavory ranking at 50,000 global deaths annually. If you happen to live in the United States or another country with access to advanced health care, however, never fear! In countries with strong medical care, the chance of a fatal snake bite drops to nearly zero: only one person in 50,000 million will die from a snake bite in the United States every year. The rest of the deadliest critters on this list fall short compared to our top three Homo sapiens predators. Our favorite household pet, the dog, falls at number 4 with an estimated 25,000 human deaths. Tied for sixth are the tsetse fly, the assassin bug, and the freshwater snail (yes, that’s right- a freshwater snail) with 10,000 each. 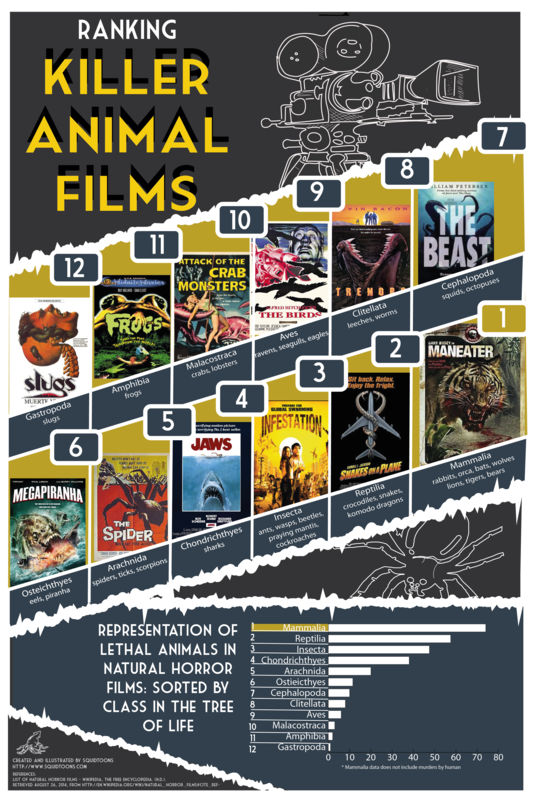 Sharks, crocodiles, hippopotamus, wolfs, and lions—some of the most feared Hollywood beasts-- barely make this list combined with a grand total of 1,720 deaths annually for all of them. Death’s caused by disease transmission from mosquitos is an incredibly serious, yet often ignored, issue. Until Hollywood starts making big-budget flicks to draw some attention to this issue, the next best thing you can do is help out. The Gates Foundation is currently sponsoring several organizations in their fight against malaria; check out this link to see which organizations they support and how to donate. Another great top-rated charity not listed on the Gates Foundation website is the Against Malaria Foundation. By purchasing insect nets, they can distribute them in the most critical areas to for them to reduce exposure. Just remember next time you’re enjoying your animal inspired horror-flick: the real human predator is out there and doing some real damage. Source: Choumet, V., Attout, T., Chartier, L., Khun, H., Sautereau, J., Robbe-Vincent, A., …& Bain, O. (2012). Visualizing non infectious and infectious Anopheles gambiae blood feedings in naive and saliva-immunized mice. PloS one, 7(12), e50464. Written by Rishi Sugla (@rishisugla). Drawn by Dana Song. Edited by Kaitlyn Lowder.